Touhenboku Ramen (Twitter: @TouhenbokuRamen, Facebook: Touhenboku Ramen) is the newest of the new when it comes to ramen shops in downtown Toronto. Opened officially just yesterday on 261 Queen West at Duncan, I had the opportunity to taste their noodles on Wednesday before their big opening day. Right off the bat Touhenboku Ramen differentiates itself from its countless competitors by offering a chicken broth base as opposed to the traditional pork broth. Continuing with the chicken theme, Touhenboku's chashu, prepared by rolling the meat into a log and then braising it at a low temperature, comes in both pork and chicken. I'm sure these two options alone immediately garner nods of approval from all the non-pork eaters out there. In addition, Touhenboku has four small donburi rice bowls on the menu with a variety of toppings (i.e. sauteed pork, grilled / roasted / fried chicken) which you can order as an appetizer or as part of Touhenboku's lunch sets. Last but not least, dessert! Unlike most noodle shops where they either have no dessert or at best, green tea ice cream,Touhenboku has six desserts on the menu. From an airy chiffon cake and a light cream puff to a dense chocolate cake, Touhenboku claims that their Japanese pastries are not overly sweet and are perfect after a bowl of their ramen. Owner Zuimei Okuyama named Touhenboku after his bar in Ueno; a suburb of Tokyo. The name, Touhenboku, means "blockhead" in Japanese and is an homage to a cafe of the same name that he used to frequent when he was young. Zuimei decided to open a ramen restaurant in Toronto after being dissatisfied with the current offering. "I want people to know the true taste of ramen and have it be fresh. So I make my own noodles in house from scratch without preservatives. The taste is just better." Zuimei says the long, slow process in creating the chicken broth draws out the collagen to create a mizutaki broth that is considerably lighter than the regular tonkotsu (pork bone) with much less fat. Zuimei also claims that the broth is great for your skin and complexion (bonus!) Zuimei trained at the Shokuno dojo, a ramen school in Chiba. Touhenboku uses custom-made porcelain bowls imported from Japan. These Arita bowls supposedly does a better job in keeping the noodles hot. Their chopsticks are also imported from Japan. Made from chef Keiichi Machida's special blend of high-protein flour, noodles are churned out daily from this $40,000 ramen machine. All Touhenboku's ramen is served with seaweed, boiled egg, wood ear mushrooms and green onion. You can choose between lean pork, rich pork, or chicken chashu, and thick or thin noodles. There are four types of broth: black (garlic), red (chili), white (original) and light. Touhenboku Ramen in a rich creamy chicken broth flavoured with either shio (sea salt) or sho-yu (soya). This bowl was with sho-yu, rich pork and thick noodles. Original Touhenboku Ramen incorporated with their special chili oil. This was with rich pork and thin noodles. A hollow round of crisp choux pastry that is split in half, filled with whipped cream and dusted with powdered sugar. 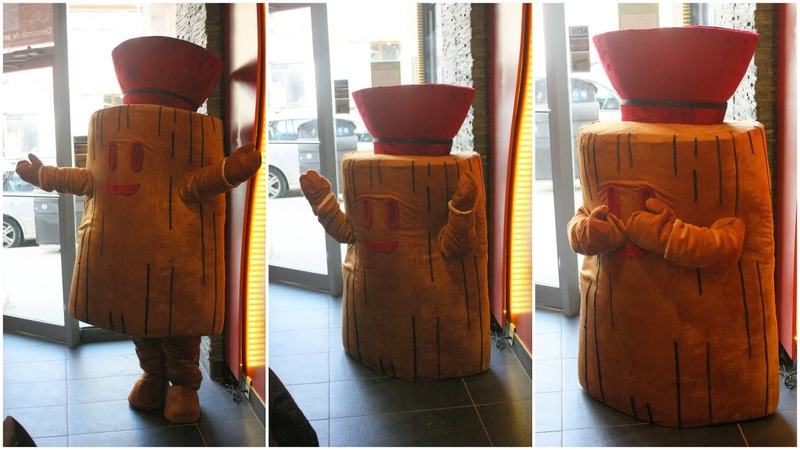 Touhenboku's mascot Tomo made an appearance too - here he is doing a little dance for us. Yes the adorable Tomo is essentially a wooden log with a ramen bowl on his head. Cute nonetheless! The broth in the Original Touhenboku Ramen is probably the richest broth I've ever had in the city. The chicken soup base was thick and creamy, not fatty, and it packed a lot of flavour without being salty (which was key for me). I chose thick noodles with this ramen but after a few slurps I realized that thin noodles would've been a better choice. With the intensely rich broth alongside thick noodles, the entire bowl of ramen became too heavy for me. In terms of texture, there wasn't much of a difference between the thick and thin noodles - they both had a soft, doughy texture as opposed to a bouncy, chewy texture. I think next time I would try the Light Touhenboku Ramen for a less heavy and filling option. Also note that each bowl of ramen comes with only one piece of chashu. This normally would not be enough for me but with the rich creamy broth and thick noodles, it was actually just right (I also chose the rich pork chashu which was obviously more fatty than the lean pork or chicken chashu but it was delicious). Of course feel free to order extra sides like chashu, egg, extra noodles, nori, and mushroom (no corn). I really enjoyed the wood ear mushrooms because they provided some crunch, and the boiled egg was tasty but I personally prefer a runnier yolk. Next, I tried the Spicy Touhenboku Ramen. I did not find this spicy at all - their special chili oil is extremely mild. The chili oil also made the soup, well, more oily... so I wasn't a big fan of that. Even though I was so full I couldn't pass on their desserts. We had two to choose from that day: the cream puff or the chiffon cake (I do not have a picture of this). I tried both and I prefer the chiffon cake over the cream puff...I actually loved the chiffon cake. The cake was really airy and fluffy with just a hint of sweetness. It was an ideal dessert after my two bowls of ramen!